Have years of neglect taken a toll on the bathrooms in your home? Are your bathrooms outdated and in need of a makeover? Are you dreaming of change, but don’t know where to start? Do you have a small powder room, a child’s bathroom or a guest bathroom that needs an update? For small cramped bathrooms, Myles will work with you to creatively maximize the existing space, and open it up with lighting and design. If there is additional room, and you desire it, you can discuss the possibility of opening up and enlarging the space. Do you dream of turning your master bathroom into a spa like setting or an oasis for relaxation? 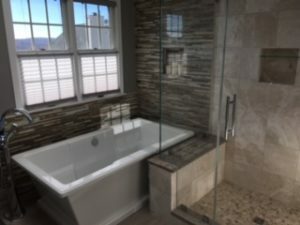 Do you long for a large walk in shower, a free standing tub or a whirlpool tub? Do you want his and her vanities? Do you prefer marble or stone? Have you thought about lighting and bathroom fixtures? Are you in need of storage space within your bathroom? Let your imagination go wild. Reach out to Myles Albert of Interior Excellence. He is a One Stop Design Shop, and will meet all of your needs from beginning to end. If you can dream it, he can create it! For those who need help with design, Myles will provide you with design ideas from his thirty years of experience creating beautiful living spaces. He will also take you shopping for your vanities, flooring, and bathroom appliances. He leaves no stone unturned!! Call Myles to schedule a free in-home estimate. No matter your budget, you can work together to create a showplace that you will be glad to come home to. All you have to do is dream! !